Why I'm doing it: Dad is once again excited to be doing the challenge. I am too. I really like my bike and skateboard so we're going to ride the neighbourhood and see what's growing close-by. maybe meet some like-minded locals. I also like the figs growing in our front yard. I intend to eat them up! Why I'm doing it: I am already doing some of this, but we all must make a concerted effort and I must do more. Thank you! Why I'm doing it: Feel we already do some local stuff but always keen to know how to do more. Why I'm doing it: As a garden writer and long term advocate of growing organic fruit and veg the Local Harvest Challenge is about putting my words into practice to an even greater extent. Why I'm doing it: I love this challenge! My husband, two children and I live on a farm. We attend farmers markets in Sydney most weekends we also buy bread/cheeses and other produce there too. That said I still find I make at least one trip to the supermarket every week for boring household items such as porridge oats nappies and tinned tomatoes. This challenge will be a great way for me to see if I can actually avoid the supermarket all together and not blow our budget! My Pot Luck Meal: nappies and tinned tomatoes. This challenge will be a great way for me to see if I can actually avoid the supermarket all together and not blow our budget! Why I'm doing it: Many of the challenges we do sporadically or used to do a lot more. The challenge is a great opportunity to refocus and realign our everyday actions with sustainable and ethical processes and systems and support people growing and producing fair tasty food. Why I'm doing it: I want to support the environment amd local produces and learn more about my area. Why I'm doing it: We are so lucky to have a great farmers market nearby a garden patch local butchers and friends who grow fruit. Yet we still find ourselves short of time and taking shortcuts when we don't really need to. Why I'm doing it: After watching "Hungry for change" online, my partner and I realised how we are now eating too much processed foods and how we need to get back to nature, the way our body functions best! we are going to eat only food that we eat in its natural form, like an apple instead of a muesli bar! We have a herb garden which we are adding too and we are going to support local farmers and food stores by not buying from the grocery store. Why I'm doing it: I love healthy fresh food with great taste and Woolworths Coles Aldi etc. just don't cut it! For a long time I've been appauled that produce takes so long and travels so far to get to a supermarket shelf and I'm excited about doing something about it even if it's just a small step in the right direction. My Pot Luck Meal: even if it's just a small step in the right direction. Why I'm doing it: I've always been interested in healing (and am studying naturopathy at the moment). One of the 'laws' of naturopathy and homeopathy is "let your food be your medicine". I wonder how many of our illnesses can be conquored before they even occur using food as our medicine. Eating locally and organically not only makes people happy, but our earth happy. Why I'm doing it: Interested in seasonal organic produce and getting back to basics eg growing, preserving & sharing. Just set up our first worm farm. Compost, grow, preserve and want to do more. Why I'm doing it: I started reading Animal Vegetable Miracle by Barbara Kingsolver last year and it really opened my eyes to how satisfying this could be. It's a big challenge! A lot will need to change... almost a fresh start really. But I'm sure it will be worth it! Why I'm doing it: I love the idea of this	I like to think this is not just for a week but for a lifetime. I believe I make pretty good choices relating to food	but	I think you can always challenge yourself even further. Looking at the list of challenges I can already see a few new things to try. Why I'm doing it: It's a great idea! Why I'm doing it: To try to improve the environmental sustainability of my lifestyle support local producers learn new skills and ideas and investigate society's dependence on overseas markets and the dominance and reliance on supermarkets in Australia. Why I'm doing it: I started ticking above be do nearly all of these alreadyI am passionately committed to creating sustainable local food systems and am heavily involved in our local food cooperative in Tassie. I also grow my own and coordinate gatherings for other growers to connect. Why I'm doing it: We need to support our farmers and small communities so that we can be truly sustainable for the future. Why I'm doing it: I already source a significant amount of produce from within a 100 mile radius, but this challenge will step things up a notch. Why I'm doing it: To eat Healthier. Why I'm doing it: It just makes sense. Why I'm doing it: I live 15 mins north of Melbourne Airport and are surrounded by local producers. I also make a few items at home from things I grow. I'm interested to see if food expensive when it is grown locally! Why I'm doing it: Wishing to challenge myself more and more to be more and more conscious fo what foods we eat and where is it coming from. Why I'm doing it: I have been growing my own good for a number of years and have recently started a local business to help others do the same. My aim is to ever increase the contribution I make to producing and preserving my own food. I have recently started making my own sourdough I make yoghurt and am planning on working on getting my own hive by the end of the year. We also have chooks. We save loads of money and eat super tasty and spunky looking food we produce. I want to show my young son where food really comes from and provide him with the skills to grow his own. Why I'm doing it: I am well aware that our food chain has been compromised and I want to know more about local produce grown by local farmers. Why I'm doing it: A friend of mine has inspired me to try this. I grew up on a farm so the idea of this is not really new to me. Why I'm doing it: I'm looking at food alternatives to the major shops! Why I'm doing it: I live smack bang in the middle of the city but have a husband from the country and a beautiful little girl. I have a pretty good inner-city balcony edible garden and am interested in urban foraging. I think we need to protect our food source and better utilise space for growing food within our cities. Why I'm doing it: I am trying to grow more vegies from heritage seeds and from my own seeds. Also grow more soft fruits etc but my area is very dry therefore need to do this without buying tank water so mulching and reuse of grey water. Why I'm doing it: I am signed up with Sustainable Table and I love what they do they introduced you guys to me. Why I'm doing it: I really want to reduce my impact on the environment and stop being a slave to the supermarket monsters! Why I'm doing it: I am so passionate about supporting local produce - after starting to grow my own fruit	veggies and herbs a couple years ago	I am now super keen to help educate other people on how important	healthy and rewarding it can be to do this for yourself. I love teaching friends about how easy it is to grow even one or two of their favourite veggies and herbs and love to see their amazement when they realise how simple it can be! Why I'm doing it: A few years of prioritising work and living overseas and we've drifted away from a sustainable, locally connected lifestyle. Loved doing the challenge in 2013! Why I'm doing it: I'm really keen to learn more about where to find locally produced food! Why I'm doing it: I want to become awake around me about food, plant, world. I want to know about the relationship between living creatures around me. And this will be the first and small step and I expect that become big meaning to me. Why I'm doing it: I've done this before and it's always good to re-focus on what you are purchasing and where it comes from. Why I'm doing it: We have started up an environmental club at our school, and this challenge is providing us with an initial focus and tuning us into the choices we make everyday relating to food, community and the environment. Why I'm doing it: Here again. We are at a wedding in northern NSW for the first week, so be interesting to try to find at least one outstanding local food for each meal... while traveling! Chance to see what's local while away. Why I'm doing it: Great "excuse" to investigate new local food options. Like the idea of the challenge week to give me a deadline and goals to work towards that otherwise get overlooked in the busyness and usual routines. Love the flexibility of this challenge that lets participants focus on the areas of interest (and definition of 'local') that works for them. Why I'm doing it: . Why I'm doing it: We really believe in the importance of buying and eating local food. Partly for the health and social benefits to us, but also to support small scale farmers who cannot compete against the big end of town. Why I'm doing it: I am a believer in eating as local as possible, reducing food miles, increases freshness and therefore nutrients and helps create communities. I have a vegetable garden that is showing me that the soil needs something put back after all my taking and I resist the effort, so feel a good challenge for me this week would be to get going with my compost, so I have chosen to challenge myself by committing to making a compost pile this week to get started. Why I'm doing it: We try to grow most of what we eat in our garden. We love sharing our produce, preserves and meals made from scratch. Why I'm doing it: I have always tried to eat locally but this will focus me even more. Why I'm doing it: I'm taking the challenge because I am interested in eating locally but need to dedicate more time to it - now seems like a great chance to learn more about my local area and what it has to offer. Why I'm doing it: To help care for the environment and be motivated to improve my efforts to help. Why I'm doing it: This provides an opportunity to have a conversation with in our family and network about the food we eat every day. Why I'm doing it: I was diagnosed with breast cancer in April 2016 & currently having Chemotherapy Treatment. I want & eed to maintain a healthy diet & lifestyle in order to regain my good health & fitness. Why I'm doing it: I dabble with buying and eating local produce but I never stick with it. I always revert to prepackaged food from large retail chains when I am short of time or out of habit. I want to stop this. Why I'm doing it: Free Logo Templates | Are you looking for free logo design template vectors or photos? Download here your logos, photos, symbols, icons Click here! Why I'm doing it: I've been committed to eating local for a number of years now. I have recently moved to NSW and want to learn about the local foods movement here. Why I'm doing it: I am hoping to make a small change in the world. Why I'm doing it: To try and live more sustainably and be more conscience of where our food is sourced from. Why I'm doing it: No better time to re-open my eyes to what's around me in my own little patch of the world! Easy to forget the possibilities amongst the noise and rush of everyday living. I'm planning to eat well, learn more about what is grown close by and prepare new dishes to entice the family! All part of the journey of living in a more whole and connected way. Why I'm doing it: I truly love food, and I think that the connection between a strong body and a healthy soul can be found in what we choose to nourish our body with. The concept of a community nurturing and lovingly caring for the produces they bring to the table, I believe reperesents the basis for a better future, where respect for nature itself and our wellbeing go hand in hand rather than exploiting our planet with no mercy. I love the ideal of communal sharing, where that element of humanity is instilled into the sourching and preparation process, with the ultimate goal of a greater good. Why I'm doing it: We love a little food challenge! Eating healthy and wholesome as well as sustainably is a big part of our family life and our Ecolosophy business ethos too. 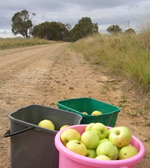 We live in WA, hundreds of kilometres from a city, farmers' market, dairy or market garden but we grow heaps of our own food and swap lots with friends. Rose has been 'big two' supermarket free for three years now which is a pretty mean feat living in a small regional town. We're hoping the local harvest challenge will push our creativity with the food we have available even further. Good luck everyone! Why I'm doing it: - The Local Harvest Challenge is a great idea, it shows that our individual efforts are part of a bigger whole and that together we are creating and inspiring change for the better. - Buying and eating local builds a vibrant, resilient local communities. - Growing food is a great teacher, it is through the effort of growing food that we develop an appreciation for how much effort really goes into getting food onto our plates. Why I'm doing it: I have wanted to purchase locally made produce and products for a very long time. I am also passionate about reducing the amount of packaging I am purchasing as a byproduct of buying food but have been stumped as to how to do this. I am very keen for ideas on this topic. Why I'm doing it: I want to support my local producers and to encourage more shop/food outlets to use organic/local produce. Why I'm doing it: Its so important to start to awake to regenerative eating!! Why I'm doing it: Love local love the idea of supporting Australians in order to know where our food is coming from. Why I'm doing it: I did this last year and found it interesting so I'm back again, but this time I think I can only eat Vic produce. This will be a good way to refresh and remind myself of the importance of supporting local farmers. Why I'm doing it: I like to know where my food has come from and how it has been produced. I also think our local food producers deserve our support. This helps them to be less reliant on food buying giants. It also helps employment in the bush. Why I'm doing it: The Gourmet Grocer is a gourmet superstore online offering the world’s fine quality food products. Our delivery is prompt and reliable. We ship all throughout Australia. Why I'm doing it: It’s so important to know where the food we eat has come from. How does that saying go think global but act local. Why I'm doing it: I am vegetarian so its already an advantage! However I have always wondered from where my food come from! The world is full of people! How food is provided to all of us?! Its a hard challenge! And its gets even harder because of the waste - a lot of food is threw away! I want to eat locally because it is a way to save energy and cooperate with local markets! Eating organic is also really important because our body and Earth are our "home" and we need to provide the best for them! Why I'm doing it: I've let the composting go as my worms were over-whelmed, but have time this week to get it sorted again. Thanks for the challenge to re-ignite my green action. Why I'm doing it: I am a local and I want to support my fellow locals. I like eating healthily and I like the idea of sustainable, ethical living. Why I'm doing it: We've recently moved to Sydney from NZ. Want to reintroduce the sustainable elements we had in our lifestyle there into our life here. Why I'm doing it: I am on a mission to change the way I buy my food. I want to eat foods that haven't travelled or been in storage for ages, I want to buy direct from the farmers supporting local businesses and I want to know who has produced the food I am eating. Why I'm doing it: Doing my bit for the environment, support the local community and be healthier! Why I'm doing it: Why wouldn't you want to? Why I'm doing it: I've been living abroad for a while where it was much harder to source the food I ate. I stopped eating meat because of it but have not progressed much since. Now that I'm in Melbourne I've decided it's time to up the ante! Why I'm doing it: We are interested to see how locally we can actually eat. Why I'm doing it: I have tried to move away from supermarkets for a long time because of their abuse of farmers. I come from a long line of farmers but I am the first generation that has not had the opportunity to live off the land. I have a huge urban block of land and I just wish to live more sustainably and cheaply and support local farmers where I am unable to grow my own (eg my local council doesn't allow bee keeping). Thank you for motivating me. Why I'm doing it: We have recently opened a coffee shop in our community and we want to support 'localism' and have more meaningful connections within our community. Why I'm doing it: I wish I had discovered this event sooner! I've dedicated my 2014 NY resolutions to most of these challenges! I look forward to further encouraging others to participate also! Why I'm doing it: It is a chance to "formalise" some of what I am doing and to encourage others to think about some of the issues. I am looking forward to to having other local families doing the challenge this year to bounce ideas off, share source of food and have a pot luck dinner. Why I'm doing it: I love being a detective. Finding out the mysterious story of my food. I'm really keen to crack open one of last year's homemade ciders. Don't know if it's a success or not yet. It's been quietly brewing for 12 months. We also really enjoyed doing the challenge with others in our area last year. Looking forward to another celebration meal. Why I'm doing it: life is so much more interesting when I inhabit the place that is all around me. Why I'm doing it: We do most of this already (almost all the ones we ticked we are already doing) - so this is pushing us that little further :) We are inspired to be the change we wish to see! Why I'm doing it: For my year 11 research project, I have chosen to research into what factors influence people’s shopping habits for fruit and vegetables in the McLaren Vale region, and how much do the benefits of ‘low food miles’ play a role in consumer decisions. I plan to discover more about the topic myself before inquiring into how others feel about it, and for my final product, creating an information chart for people to have in their kitchen, informing of seasonal produce, and where it can be sourced locally. Why I'm doing it: I would like to source local produce as I would like to reduce food miles associated with my food and know where it comes from. Why I'm doing it: It's a great idea and motivating to do it alongside others. Great to have a week to focus on and commit to. Why I'm doing it: To become more educated and aware of what myself and mt family are eating and to support local farmers. Why I'm doing it: A growing awareness of food miles, a growing compassion about reducing food wastage and supporting local communities. Why I'm doing it: A vegan who loves to cook. I want to source local produce and be more environmentally aware with my food choices, to be a conscious consumer. To be a locavore is my main aim and goal. Why I'm doing it: I am a semi-vegetarian, and supporter of animal rights. I can't believe the atrocities that occur in factory farms worldwide daily. It alarms me that animals can be treated in this way. I need to step up and support local dairy farmers and producers so that we eat locally and support the local farmer. Why I'm doing it: Living away from my garden and my infrastructure (bottling jars, containers, thermos for yoghurt, local swap) this year I feel a bit slack so this is a chance to refocus. Also really intrigued by how much food in the local organic shop comes from Spain, so going to try and dodge that for a week. Why I'm doing it: After living overseas for a number of years and having the opportunity to travel extensively I have come to realise that one of the best ways to change the world (and make a positive difference) starts locally through community action. Now that we have put down roots (with a bambino and a home) I couldn't pass up the opportunity to participate in the 2014 Local Harvest Challenge to focus one week (and beyond) eating locally and sustainably sourced food. Why I'm doing it: We are totally committed to sustainable food growing for Australia. We are aware of the impacts of climate changes, peak oil and phosphate, competition for land use ( water and food VS coal, CSG ad other extractables). Australia is a net importer of all fruit and vegies - not acceptable. We are encouraging and providing training for our community on how to grow fresh, organic, nutritious vegetables and fruit. We are trying to reinvigorate horticulture as a career path for people. Farmers are now receiving an average of only 9% return for their produce - 40% is the minimum needed. Now that this gov't has decided to send fuel refining offshore it would only take one week break in supply for food delivery and production to cease (see NRMA report). There is a food and water related riot/incidence each week in the world... Australia has been shielded from this but not for much longer. If for no other reason growing and eating your own food is challenging, fun, rewarding, therapeutic and a wonderful way to get in touch with the environment.It also keeps you fit and healthy! Why I'm doing it: I care about where my food comes from and how it's produced, and while I think I already takes steps towards eating locally and sustainably, participating in a challenge will bring new perspective to my day-to-day experience. Why I'm doing it: I came across your website this weekend. Unfortunately, I don't live in Australia but I love the idea and would love to participate as an international guest. I was unable to find anything close to this in the area I live in the United States. I live in Kansas City, MO and would love to participate this year in your challenge. Maybe next year we could partner up as a sister city. Thank you for your consideration. Why I'm doing it: There's always more I can do to reduce my environmental footprint. Why I'm doing it: this sounds like fun - and is a way of getting people together to celebrate and to be more aware of sustainability issues - thanks for organsing it. Why I'm doing it: We believe that eating locally is part of building a resilient, sustainable community, educated in good nutrition. Eating locally also reduces food miles (or kilometres! ), and is part of making this a sustainable planet. Finally, it is fresher and we have more control over how the food has been grown and processed. Why I'm doing it: I've been trying for the past 18 months or so to live more ethically in a variety of ways including being aware of what I eat, what I purchase, what I throw away and what organisations I support. This challenge is a great incentive for me to put into practice a number of things I've been wanting to do for some time now. Why I'm doing it: It is too easy to be slack with food and food choices. this is a good reminder not to always take the time poor option. Why I'm doing it: Already a keen vegie grower but keen to use local suppliers and finding out who they are. Why I'm doing it: Because I belong to a great veggie swap group and feel very encouraged by them. Would like to be able to eat from mostly Australian product, Victorian only is my goal. Why I'm doing it: Started with the Ethical guide to supermarket shopping, and loved it. Really need to support Australian food, even if it costs more. Why I'm doing it: Being a locavore is important to me, I like to grow and prepare as much of my own food as I can as well as buy locally grown produce where possible. Why I'm doing it: Visiting the local farmers market is my once-a-week indulgence. I love meeting the producers and enjoy the small talks with people in the community! Why I'm doing it: Belong to a Sustainability Group; dislike the non-ethics of the big supermarkets; want to reduce food miles. Why I'm doing it: We grow a lot of our own food, and yet we still let convenience dictate those regular trips to the supermarket. The challenge is a welcome way to focus on making the most of the healthy and diverse food we already have on our doorstep. It's also a brilliant way to discover other local food treasures - animal, vegetable and human! Why I'm doing it: I often eat local, but want to challenge myself to do it exclusively for a week to learn more about what's around! Why I'm doing it: We have just moved to Bendigo, and are trying to re-locate ourselves in terms of food options. Have found some local growers at the weekly markets, but struggling to source affordable meat options. The Local Harvest challenge gives us inspiration to keep at it! Why I'm doing it: I would like to find out more about sourcing produce locally and promote this amongst my friends and colleagues. Why I'm doing it: Excited again to be intentionally trying to get our food from 'closer' than ever before. This year we're concentrating on using our own produce - so stuff from our garden and the things we've preserved throughout the year. Keen to do it with others this year too. We've a team called the 'westies'! Why I'm doing it: To build on the changes we have already made to our procuring of our food. Why I'm doing it: I regularly buy and consume local food and support local farmers by being in a co-op, but I'm interested taking that to the next step by trying to be 100% local for a week. Should be fun! Why I'm doing it: We participated in the challenge last year and it really kicked off a year of exploring and change. We buy most of our food at the local farmers market, supermarkets are only visited for toilet paper and the like. I now make my own sourdough bread, cheese, yoghurt and more (even started to make my own soap) and have found thousands of like-minded people out there. Cooking has always been an important part of my day, I just like to eat well and we eat better than ever before, with much more veggies and fruit (although I do not eat meat since I was 12). It is possible to go more sustainable and local, even in big cities, you just need to look for it. Thank you Local Harvest for challenging, it has certainly changed my life and I look forward to learn so much more! Why I'm doing it: I am so passionate about supporting local produce - after starting to grow my own fruit, veggies and herbs a couple years ago, I am now super keen to help educate other people on how important, healthy and rewarding it can be to do this for yourself. I love teaching friends about how easy it is to grow even one or two of their favourite veggies and herbs and love to see their amazement when they realise how simple it can be! Why I'm doing it: Because its important on so many levels! Why I'm doing it: I was initially inspired to shop at farmers' markets for health, enjoyment, and to get outdoors. I then started buying organic and picking up produce from a farmer in moorooduc, he and some others began to educate me on the nasties of chemically enhanced foods etc. and I bought a book called "Shop Ethical!" where I found your website and started surfing... to find this challenge, which I'll be getting my whole family and some friends involved in :-) Thank you! Why I'm doing it: Im taking on the challenge because I beleive it will help to structure my current efforts for sustainable living. Why I'm doing it: I like a challenge - sometimes shopping for food just becomes a chore and no thought goes into where products come from - I have decided to become more organised in 2013, and look closely at our purchases and find out more about local producers and growers. This challenge will allow me to purposefully be in charge of where our food comes from. Why I'm doing it: We like to eat seasonal, local, sustainably grown food the challenge is to see how self-sufficient we can be. Why I'm doing it: I am convener of local produce swap group so support any idea that promotes sourcing local seasonal food. Why I'm doing it: Shouldn't we all be doing this!!! Why I'm doing it: I have been writing a blog www.tasteofthetopend.com all about growing and eating as much local food in the Darwin region- this can be quite challenging for many reasons. There is no local meat or dairy industry, 100% of dry food and 97% of fresh produce is trucked in more than 3000kms. Saying this there are great community gardens and networks- but right now these are small and we are trying to spread the word! Why I'm doing it: It's a great endeavour. People need to adapt their eating habits to the location they have chosen to inhabit. You will learn a lot about your local environment whilst feeling much closer to it. Why I'm doing it: For a few years I have been slowly changing to many of the challenges mentioned above. I grow vegies and fruit but have had a disastrous season! I am part of a local food group which is promoting a variety of local food activities such as food swaps, community gardens, food co-ops, and many more. I am part of a Herdshare group, ferment various foods and grind our own grains. The challenge will enable me to share the commitment more with family and local friends! Why I'm doing it: I have been living a Tassie-only diet for 11 months - I set myself a 12 month challenge and it is nearly over now. I won't lie - sourcing and eating only food grown in Tasmania has been harder than I imagined. But it has been worth it. My kids and I are much more aware of where everything we buy comes from now - not just food. My heart swelled when they noticed and asked me why all their toys are made in China and not Tasmania! A week is easy peasy people - just do it!!! Why I'm doing it: Eating Locally, Buying from Local Shops and enjoy fresh handmade meals not from over sized packaging. Why I'm doing it: I currently endeavour to eat seasonal and local produce, however I want to challenge myself to branch out and source more local and ethical produce and products, which are not just your typical fruit and veg. I also want to use this challenge to show friends and family just how easy it is support our local economies, whilst helping our environment and our supporting our own health! Why I'm doing it: I'm sick of wondering how long my food has been sitting in a warehouse, and having no understanding of if it has nutrients in it or not, this seems like a good way to start a new habit of buying better quality food and supporting the local market. Why I'm doing it: We love local foods anyway but to see this challenge is encouraging others to take part and really get behind sustainable local foods is fantastic! Why I'm doing it: I think it's important to support local producers, whom can guarantee your food. It is also a lot of fun growing and eating your own veges and fruit. Why I'm doing it: Live where eating local can be very difficult. Interested to see just how much can be achieved whilst still maintaining healthy balanced varied AND interesting diet. Why I'm doing it: To inspire a change in community behaviour and introduce a healthy, happy lifestyle that doesn't cost the earth. Why I'm doing it: I am trying to help people to start organic gardens but struggle to push myself to eat well somedays. This will help me realize how far i have come as well as encourage me to get back on track with my objectives and my health. Why I'm doing it: Sounds like fun! Why I'm doing it: Will be starting a week late due to a trip away but then a full week, extending to changing over as much as possible to local, sustainable, fairtrade and/or packaging free. Why I'm doing it: to meet like minded people. Why I'm doing it: Keen to be part of the challenge - it's a part of our bigger project to eat sustainable, delicious food on a budget for 2013. More info here: ourfoodroots.wordpress.com Thanks Sustainable Table! Why I'm doing it: I feel I've gotten slack about my food choices and living sustainably. I even missed Lent this year (my usual recharging time on packaging and supermarket reduction). And a friend told me about the challenge so I'm in! It also ties into some things we are getting our students to inquire about next term, so I'm hoping to get some background info. Why I'm doing it: I think that I am trying to eat locally and sustainably wherever possible but I want to use the challenge to really focus my thinking and allow me to examine where I am sourcing my food from. I am going to blog about my experience at thecookspyjamas.com to try and highlight the fact that eating locally (particularly in WA) isn't as hard as people think. Why I'm doing it: i already do this, i have a garden with over 140 varieties of edible plants, live across the road from the mulchpiy community garden am the grounds coordinator for lakeside drive community garden at alawa (7mins bike ride) and deliver produce from aweganic gardens (my microfarm) to darwins only organic food retail outlet which is only 700 odd footsteps away. and support with growing finances and implementation of the top end edible verges project wullla!!!!!!!! Why I'm doing it: It is natural for me to garden, grow some food and herbs, be part of community, however when short on time, funds or fitness it is too easy to just grab whatever is quick and available. Challenging ourselves to focus on what we can change, to the extent we, as a family, are able leaves room for plenty of positive choices. Why I'm doing it: We are doing this to show that it is easy to eat local (even on a budget) with a little planning and organising. Why I'm doing it: To support sustainable initiatives, creating a 'back to basics' approach to living off the land and protecting the Earth's precious resources. Borrowing and using the land, animals and plants in the most sustainable, renewable method we know how. Why I'm doing it: This challenge seems to be the perfect way to support local, ethical produce and eat healthily at the same time. Why I'm doing it: I want to live more sustainably to lower my impact on the earth. I also want to start gardening to teach my daughter where food comes from and for us to be able to eat healthy, organic foods without a huge cost. Why I'm doing it: I decided to take the challenged so I expand my knowledge of local produce. I already shop weekly at the farmers market but would like to know even more local choices. My inspiration is my children. Knowing they will make healthier more ethical choices as adults because of what they learn from me today. Why I'm doing it: Have PDC and a garden growing veggies and herbs, some chooks and half a dozen fruit trees( not all producing yet). Want to reduce food miles further to decrease carbon footprint. Why I'm doing it: I realised I had been on a diet since age 7, I am now 33. I am sick and tired of my dysfunctional relationship with food. I have long been a fan of River Cottage, and Hugh Fearnley-Whittingstall, when I think about slow food, growing and going to markets, I feel happy, and my relationship with food feels right. Why I'm doing it: 2 months ago I changed our families diet to additive free... no artificial flavours, colours or preservatives. It has been a fantastic change for the better, this is the next step. Why I'm doing it: I am a member of Sustainable Communities SA and we aim at much of this all the time. This will help me focus on new things I can do and think about. Why I'm doing it: As a garden writer, and long term advocate of growing organic fruit and veg, the Local Harvest Challenge is about putting my words into practice to an even greater extent. Why I'm doing it: I love this challenge! My husband, two children and I live on a farm just out of Orange NSW where we raise deer. We sell our venison (Mandagery Creek Venison) at farmers markets and through our network of local food stores in this area. Orange has a really strong local food and wine culture so we are lucky to have access to some beautiful local produce. Plus, as we attend farmers markets in Sydney most weekends we also buy bread/cheeses and other produce there too. That said, I still find I make at least one trip to the supermarket every week for boring household items such as porridge oats, nappies and tinned tomatoes. This challenge will be a great way for me to see if I can actually avoid the supermarket all together and not blow our budget! Why I'm doing it: we do some of this already and want to encourage any movements involved in this. plus, school holidays makes it easier to do it as a famiy learning exercise. thanks for making the info available about who's where and doing what. makes our job much easier. Why I'm doing it: Many of the challenges we do sporadically or used to do a lot more. The challenge is a great opportunity to refocus and realign our everyday actions with sustainable and ethical processes and systems and support people growing and producing fair, tasty food. Why I'm doing it: We are so lucky to have a great farmers market nearby, a garden patch, local butchers, and friends who grow fruit. Yet we still find ourselves short of time and taking shortcuts when we don't really need to. Why I'm doing it: Love the 100 mile concept and the power it has of improving our community and reducing the impact on the planet of Green house gases. It just makes sense, doesnt it? Why I'm doing it: We have teamed up with other high profile 'foodies' in the Orange region (NSW) to prove that eating locally almost all the time is completely possible. We will all be blogging, tweeting and Facebook'ing our results with all ingredients coming from A Slice of Orange - regional providore. Why I'm doing it: I love healthy fresh food with great taste and Woolworths, Coles, Aldi etc. just don't cut it! For a long time I've been appauled that produce takes so long, and travels so far to get to a supermarket shelf and I'm excited about doing something about it, even if it's just a small step in the right direction. Why I'm doing it: I seek to grow my own vegetables. They taste much better and are organically grown. Unfortunately I am not able to have a continuous suppy so we have to buy some things. Why I'm doing it: I'm traveling for the week April 1-8. Usually I'd 'take the easy route' and buy meals from takeaway shops and cafes but I'm going to try my best to buy from markets, cutdown on packaging and eat organic / local products! Why I'm doing it: I've always been interested in healing (and am studying naturopathy at the moment). One of the 'laws' of naturopathy and homeopathy is "let your food be your medicine". As a Wiccan, and environmentalist, this really rang home. Lately I have been through a bad time with my family members developing cancer and other illnesses and myself with celiac and nut allergies. I wonder how many of our illnesses can be conquored before they even occur using food as our medicine. Eating locally and organically not only makes people happy, but our earth happy. Why I'm doing it: I started reading Animal, Vegetable, Miracle by Barbara Kingsolver last year and it really opened my eyes to how satisfying this could be. It's a big challenge! A lot will need to change... almost a fresh start really. But I'm sure it will be worth it! Why I'm doing it: I love the idea of this, I like to think this is not just for a week but for a lifetime. I believe I make pretty good choices relating to food, but, I think you can always challenge yourself even further. Looking at the list of challenges I can already see a few new things to try. Why I'm doing it: Be the change you want to see in the world " Ghandi.. That says it all . Be accountable for what I do . Feel and eat !!! Why I'm doing it: To try to improve the environmental sustainability of my lifestyle, support local producers, learn new skills and ideas and investigate society's dependence on overseas markets and the dominance and reliance on supermarkets in Australia. Why I'm doing it: I am on a continual sustainability journey and am trying to become more in tune with how my eating impacts the earth. I love good food and know that there is a whole world of wonderful food out there that I am missing out on by just shopping at the big supermarkets. Why I'm doing it: I heard about the challenge from my local coop. I'm doing it because every small change I make adds up to be a much larger change. Also once I adopt some practices I will most likely continue with them after the challenge. Why I'm doing it: I am passionately committed to creating sustainable local food systems and am heavily involved in our local food cooperative in Tassie. I also grow my own and coordinate gatherings for other growers to connect. Why I'm doing it: Joining with six other businesses (A Slice of Orange, Define Wine, Racine Restaurant, Bendy Street Emporium, Hamiltons Bluff and Mandagery Creek Venison) in the Central West (Orange/Canowindra regions) to promote our businesses and to prove/show that locals can purchase enough food/produce locally to feed their households! Why I'm doing it: Living at Hamiltons Bluff Vineyard in Canowindra (near Orange), NSW, I already source a significant amount of produce from within a 100 mile radius, but this challenge will step things up a notch. Although not an official "team", I will be taking up the challenge with other regional foodies - A Slice of Orange, The Bendy Street Emporium in Canowindra, Nashdale Fruit Co. and Local Lovely. Together, we will blog, tweet and Facebook our Local Harvest Challenge. Why I'm doing it: I have been growing my own good for a number of years and have recently started a local business to help others do the same. My aim is to ever increase the contribution I make to producing and preserving my own food. I have recently started making my own sourdough, I make yoghurt and am planning on working on getting my own hive by the end of the year. We also have chooks. We save loads of money and eat super tasty and spunky looking food we produce. I want to show my young son where food really comes from and provide him with the skills to grow his own. Why I'm doing it: After becoming a vegetarian 6 months ago it seemed logical to start my own vege garden. As a result I am able to enjoy fresh homegrown veges, save $'s and any fruit purchased is lobtained locally. (within 5kms.) Happy to share info/seeds/excess veges with other local people. Why I'm doing it: I am signed up with Sustainable Table and I love what they do, they introduced you guys to me.